Description: As a first order witness of the Greek New Testament, Family 13 has a long history in the field of textual criticism. Nearly seventy years after Kirsopp and Silva Lake�s publication, La Famille 13 dans l��vangile de Marc offers an enlarged, wholly up-to-date and thoroughly revised study of the text of the Gospel of Mark for the witnesses considered as family members by Didier Lafleur. His extensive survey includes the history of the discovery of the manuscripts, their codicological description and new research on the text. The most part of the book is devoted to the edition of minuscule 788 (Athens, Nat. Lib. 74), considered by the author as the nearest member to the archetype of the group (f 13). Based on quite new collations for the all extant manuscripts, the edition provides a positive apparatus. 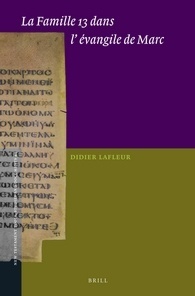 Citation: Thomas J. Kraus, review of Didier Lafleur, La Famille 13 dans l'evangile de Marc, Review of Biblical Literature [http://www.bookreviews.org] (2014).